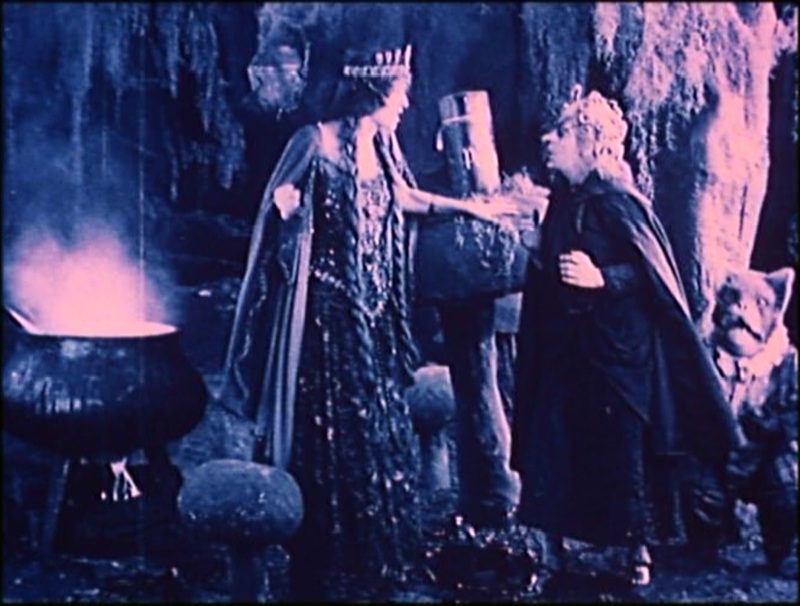 Fairy tales made good sources for early silent movies – they were child-friendly, had simple plotlines that were already familiar to nearly all audiences, and gave opportunities for the use of camera tricks to represent their magic. This one in particular was fondly remembered years later by Walt Disney, who saw it as a teenager, as one of the inspirations that made him want to make movies. The movie begins with an odd prologue that seems out of place today: Santa Claus enters a modern home and conjures a Christmas tree and several dolls. A small child peeks out to see this wonder, and is all the more amazed when the dolls come to life and represent diminutive versions of our cast on her tabletop. 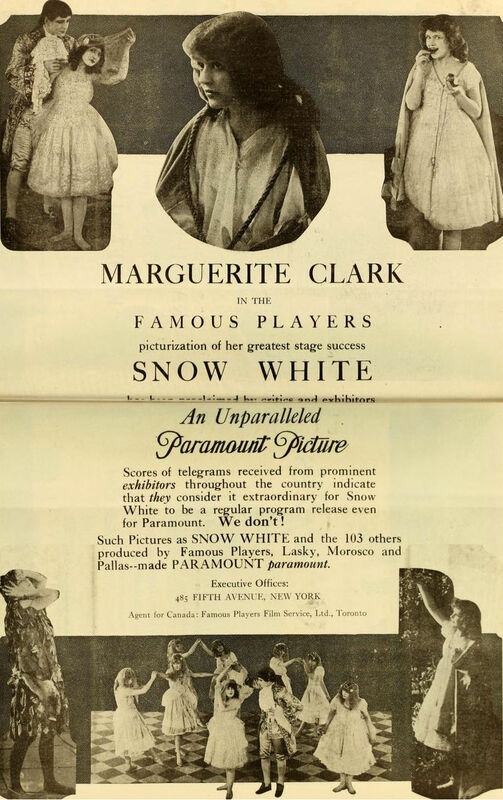 The movie then moves into more familiar territory with a Queen who pricks her finger while sewing on a snowy day, and then wishes for a child with snow white skin, blood red lips, and jet black hair. Of course, she gets the child but dies shortly thereafter and Snow White (played by Marguerite Clark) is raised by an evil stepmother who conspires with a witch to become the “fairest of them all.” The witch gives her a mirror that always tells the truth and warns her that, if it ever breaks, her true ugliness will be revealed. Meanwhile, Snow White drudges in the kitchen, but still gets to have eight or nine ladies in waiting, all of whom have nicer clothes than she does. She goes to visit her friend the huntsman and his three children, and along the way she meets the Prince of the neighboring country of “Calydon” (Creighton Hale). They seem to like one another, but she’s coy and doesn’t tell her name. She also convinces the children to release a bird from its cage. Then there’s a ball, and Snow White dresses as one of her own ladies in waiting to get in. She gets to dance with the Prince, who announces that he’s in love with her, but the Queen says they have to wait a year to get married while she sends Snow White to finishing school. Now the Queen orders the huntsman to kill Snow White and bring her heart (the witch wants to eat it because then she will get Snow White’s hair). If he fails, his children will be locked in the tower to starve, so he reluctantly agrees. Of course, he can’t do it and kills a pig instead. But, he does abandon Snow White in the middle of the forest, apparently quite close to a lion which never actually gets into the same shot with her. Fortunately, the little bird comes back and convinces Snow White to follow it to the Dwarves’ house. They are out mining and Snow White steals some of their food and sleeps in one of their small beds. Then, they come home and find her there, and immediately they want her to stay “so they can look at her.” They pile gifts before her while she sleeps, and she apologizes for stealing food when she wakes up. One Dwarf sleeps in a barrel so she can keep the bed. 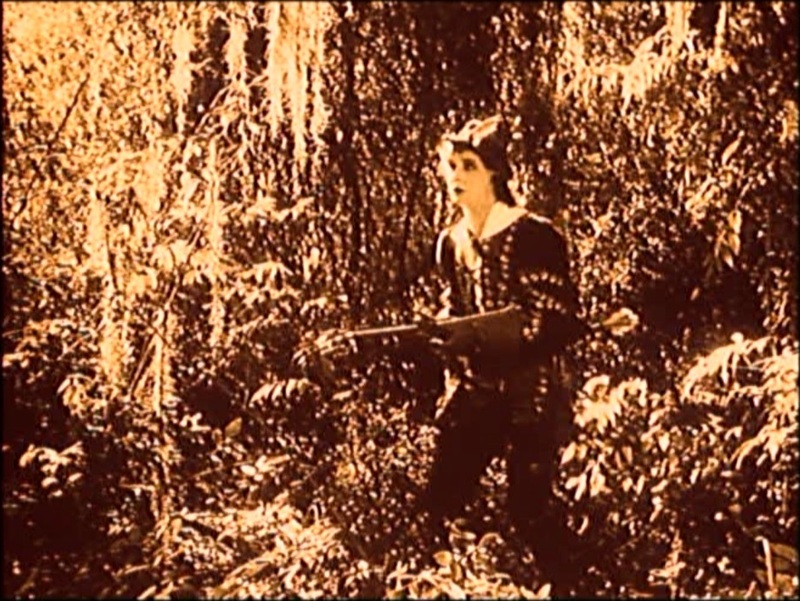 Then, they go off to their mines while Snow White sews and dances with butterflies. The Queen has figured out how she was deceived now (the witch’s hair turns into pigtails), so she locks up the huntsman and his kids. He manages to escape by bending the bars, and luckily the little bird gives him some rope to haul up the kids and he strangles a guard and takes his keys. The Queen and the witch have turned the Queen into a traveling crone, and she convinces Snow White to put a poisoned comb in her hair. She falls down dead, but the little bird tells a rabbit, who summons the Dwarves. They take the comb out of her hair and she’s OK. Now the Queen turns into a Pieman who gets her to eat a poisoned apple, which apparently the Dwarves can’t heal. They get the Prince, who mourns his love’s death, and also the huntsman who vows bloody revenge. They take the body to the castle and confront the Queen, but while they do so, Snow White comes back to life because the bit of apple comes un-stuck from her throat. The Queen smashes the mirror and turns ugly and the witch gets the Queen’s hair, which makes her happy. Then everyone bows to the new Queen – Snow White. She marries the Prince and invites the Dwarves to stay with them in the castle. There are some scenes that jump in this movie, and it’s sometimes not clear what happened in between. I’m going to give the benefit of the doubt to director J. Searle Dawley and assume that the existing print is missing some frames. Since it was lost for nearly 80 years, we should be thankful to have it at all, and it’s possible to guess what happened in between. Most of the movie is shot in long- and medium-shot, generally in theatrical proscenium-style with exits and entrances by actors and no camera movement, except the tilt downward that introduces Marguerite Clark on the kitchen floor. The story mostly plays out sequentially, but we get inter-cutting to heighten tension in the scenes where Snow White is poisoned by the comb and the escape of the huntsman. Unfortunately, these are some of the jumpier parts of the movie, suggesting that either damage or badly done re-cuts messed up the storytelling. The prologue is explained by the fact that the movie was released on Christmas of 1916, though it still seems out of place. Clark was 33 years old when this movie was made, and had played the role onstage for two years. She was short and girlish, so it still works, and I think her added acting experience made her a better choice than most young actresses would have been. The costumes deserve a mention – most of the cast is in what seem to be French-style clothes from the Court of Louis XVI, although the Calydons wear what look like more English styles. As the Prince, Creighton Hale actually gets the most interesting costumes: when we first meet him he looks sort of like Robin Hood, then his clothes are more like Elizabethan-era nobility, and at the end he has a tri-corn hat and cloak, like a Revolution-era civilian. By comparison, Marguerite starts out in rags, but moves up to the somewhat frilly dress of the ladies in waiting, and then spends the rest of the movie in a bland, fairly shapeless dress. At the end they stick a crown on her head and call it good. There’s an interesting hierarchy of height in the movie: Clark is about the same height as all her ladies in waiting, who are in general much shorter than the other adult actors. The Dwarves are played by children, who are of course shorter than anyone, and the huntsman towers over everyone, reminding me at times of Charlie Chaplin’s villains Mack Swain and Eric Campbell. Fans of Grumpy, Sneezy, etc. won’t get much out of these Dwarves, they have names like Flick, Glick, and Wick and are pretty interchangeable. In light of the story about Disney, I kept an eye out for familiar-looking scenes. The animated “Snow White and the Seven Dwarfs” was one of the first movies I went to as a child (I cried during the lost-in-the-forest sequence and my parents had to take me to the lobby). The sequence where Clark dances with birds and butterflies looks somewhat like Disney’s interpretation, as does Snow White in her bier after death. Really, though, the main shot that made me think of the animated version was a mid-shot of Clark sewing at a window while light streamed onto her face. Of course, Disney’s memory had probably faded in the intervening 21 years, with the original listed as “lost” all that time. I intended to only watch a few minutes of this film, and now I’ve seen nearly half of it. Marguerite Clark is quite charming, and she has real Star quality. I don’t think I’ve ever seen her in a film before. Glad I dragged you in! Clark had been a successful stage actress and was only in pictures for about two years when this came out. Somehow, she knew to avoid the mistake of over-gesturing that most theater stars made when they transitioned to silents (could be good directing, too). She got to be a huge star by about 1920 then decided to retire and stopped acting altogether.